Campers enjoy the relaxed nature of the Quiet Campground. Of those campers, many are families who prefer peace and quiet at night. If you're looking to get a good night's rest after those long days soaking in all the great sights and sounds at the festival, the Quiet Campground is the place for you! About 2,000 festival friends camp for the weekend in the Quiet Campground, setting up a magical temporary community in a wonderful forested area. It's 4km away from the festival site which is a leisurely bike ride, a quick commute or leave your car parked and take the free, convenient shuttle. There is plenty of room for tents in the Quiet Campground. All RV units in the Quiet campground must purchase an RV ticket. This new RV ticket will help us better manage the capacity and safety of the Quiet Campground. The designated RV area is Zone 6A. The Quiet Campground opens at 8:00 AM on Wednesday, July 10. Birds Hill Park gates are closed between 11:00 PM and 7:00 AM daily. Quiet time is in effect between 11:00 PM and 7:00 AM. The Quiet Campground closes at noon on Monday, July 15. Everyone needs to be packed out by then, leaving their campsites exactly how they found them – clean and green! There are flush toilets and outhouses, water taps, picnic tables, fire pits and park shelters for communal use. Firewood and ice delivery trucks drive around the campground in the morning and early evening. You'll find electrical outlets at each communal park shelter. Please do not leave cell phones or batteries unattended and be sure to share the plugs with your fellow campers! This is the only location with electricity in the Quiet Campground. Lost and found is located by the Quiet Campground Box Office. The campground shuttle leaves every half-hour from marked bus stops along the main road from all three campgrounds to the festival site. There are services in the Birds Hill Park Campground, which is not far away from the Quiet Campground, that you are welcome to use. Coin operated showers that take loonies and toonies and cost $1.00 per three minutes. Coin laundry machines that cost $1.75 wash/$2.00 dry. It takes quarters and loonies. The BHP Campground Store has wood, ice, food, earplugs, camp gear and other items for sale. We need you to help create a safe and respectful culture at Folk Fest and in our Quiet Campground. Please remember that you are responsible for yourself at all times, and kids if you are attending with minors. Safety volunteers (in blue vests) are there to ensure a safe and enjoyable environment for you and provide help if you need it. If you see someone acting irresponsibly or requiring first aid assistance, please contact a safety volunteer. The Quiet Campground Box Office is your one-stop-shop for assistance. We monitor weather and have a plan to deal with inclement weather and emergencies. In the event of an emergency, follow the direction of safety volunteers. Facebook and Twitter will also have up-to-date information. There is lots of traffic Wednesday morning as there are many eager Festival Campers arriving then. If you want to avoid the rush, we recommend you arrive a little later in the day. There is lots of room in the Quiet Campground, and many folks wait until Thursday to arrive. If you still want to be the first in line, the West Gate of Birds Hill Park opens at 7:00 am. East Gate opening will be delayed until approximately 10:00 am. 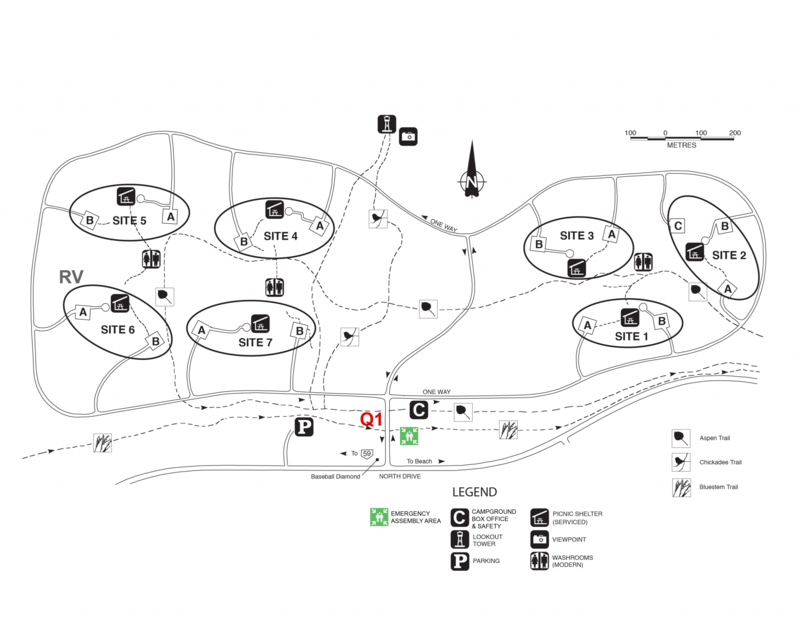 To get to the Quiet Campground, drive through the West Gate on South Drive, and then continue onto North Drive. Do not follow the traffic turning right on to Festival Drive. Keep your eye out for signs posted along the way. 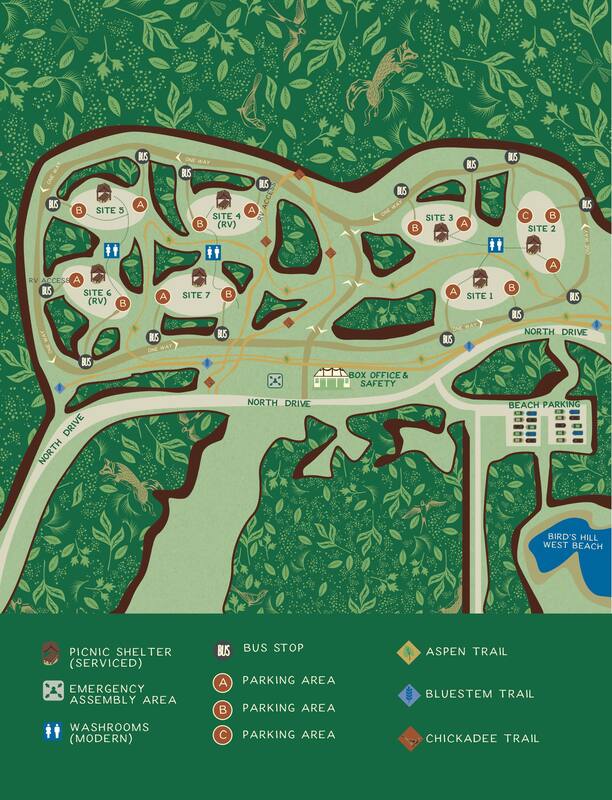 Take a walk around the campground when you arrive. Note the locations of porta-potties, water taps, service areas and shade structures!